Ghazi Malik, Alauddin Khalji’s general was put to throne with the title Ghiasuddin Tughlaq, after the defeat of Khusro Khan in 1320. The location of the fort, some 7 kms east of the earler cities of Lal Kot & Siri, was entirely dictated by strategic concerns. And so this rocky outcrop was picked, surrounded by ravines on the north, east & west and bounded on the south by a flat plain. 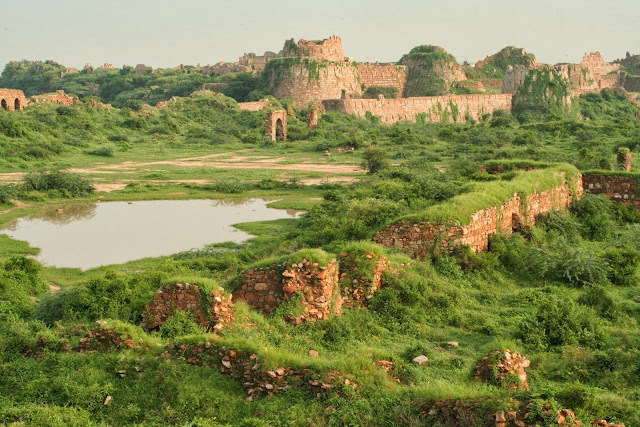 This third city of Delhi was enclosed with an area of around 6.5 sq.kms, which due to the lack of maintanence and management could be seen in a disastrous situation with pond and unwanted grass and plants with no sense of human values and they say, it's a protected and conserved monument. The fort was completed in just a span of around 4 years, as all the labourers around Delhi, were deployed in the construction of the same. sufi saint, Nizamuddin Aulia, pleaded to the Sultan to spare some workers for his 'baoli'(wellness) which he declined. On this Aulia is sail to have given two curses to him : ‘ya rahey gujjar, ya rahe ujar’ and ‘hunuz dilli door ast’(Delhi is yet far). On the inauguration of the new Capital, Sultan died under said conspiracy hatched by his son, Mohammad-bin-Tughlaq. The fort after the tragic death of his buiider, never got occupied and was finally abandoned in 1327. Following the abandonment, a settlement of the gujjar herdsmen, as per the prophecy came up within the precincts, which later was known as Tughlakabad village. Beautiful sunset - Worst Condition Children from the surroundings could be seen playing their sports here at various sites inside the fort. Animals could also be seen like buffalo, donkey, etc, grazinf grass here. The fort is under disastrous situation as far as the conservation of some place which holds very much importance as far as our history is concerned. 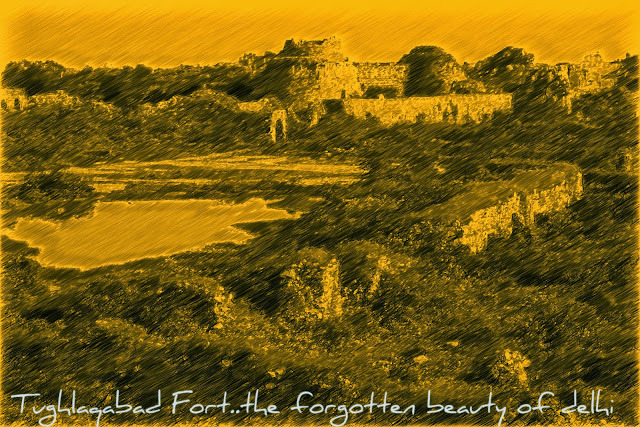 After the formation of the Archaeological Survey of India, the fort was declared a protected monument. However, over the years, the villagers encroached upon the land of the fort beyond the limit of the village building houses and selling plots. Due to political exigencies, the leadership and the Government of the day has always preferred to look the other way. It’s a ruined fort. Its’ open for the visitors from sunrise to sunset and few things are still the same way. The ignorance of the authorities at proper time, resulted in the so-called illegal human settlement, which could have been avoided or either could still be saved, as extreme situtation is still to occur. The villagers tries to prove their existence to be around 700 years with no real evidences for it, some historians believes it to be at least 300 years old. Built-up and infrastructure has improved quite a bit with very poor civic amenities and facilities. There’s sewage problem, people are still poverty-stricken. Employment rate has however increased with being in the vicinity of the national capital, but education status hasn’t increased to the level. If the fort hadn’t been a ruined one, than it may attract the tourist and may help in increasing their income. The historic city of Delhi consists of the seven capital cities formed at different eras of the history of the Indian Subcontinent. 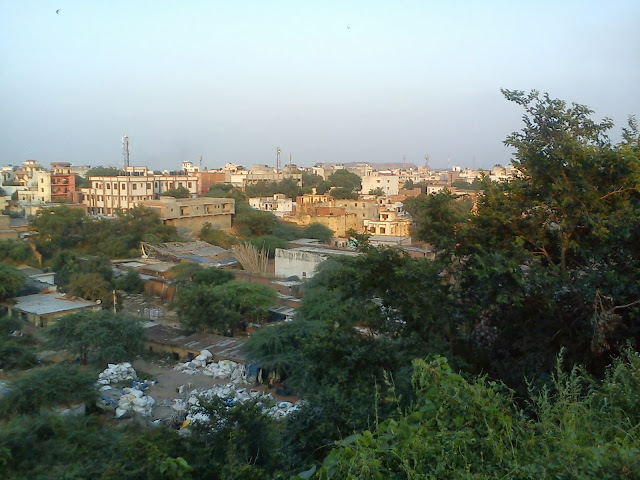 The city of Tughlakabad can be seen the worst mainatained and managed of them all. What it all needs, is just a proper care, maintenance, and firstly the upheaval and it could only add to the economic value of the national capital city of The Republic of India.